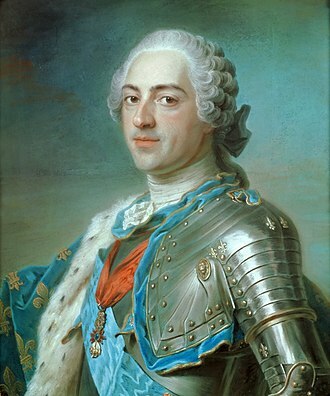 For other people named François Boucher, see François Boucher (disambiguation). A native of Paris, Boucher was the son of a lesser known painter Nicolas Boucher, who gave him his first artistic training. At the age of seventeen, a painting by Boucher was admired by the painter François Lemoyne. 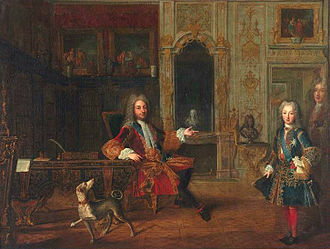 Lemoyne later appointed Boucher as his apprentice, but after only three months, he went to work for the engraver Jean-François Cars. 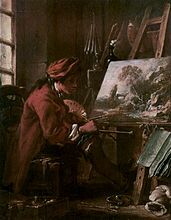 In 1720, he won the elite Grand Prix de Rome for painting, but did not take up the consequential opportunity to study in Italy until five years later, due to financial problems at the Académie royale de peinture et de sculpture. On his return from studying in Italy he was admitted to the refounded Académie de peinture et de sculpture on 24 November 1731. His morceau de réception (reception piece) was his Rinaldo and Armida of 1734. 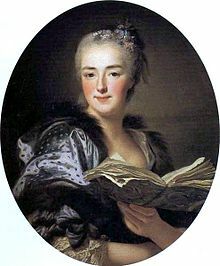 Boucher married Marie-Jeanne Buzeau in 1733. The couple had three children together. Boucher became a faculty member in 1734 and his career accelerated from this point as he was promoted Professor then Rector of the Academy, becoming inspector at the Royal Gobelins Manufactory and finally Premier Peintre du Roi (First Painter of the King) in 1765. Boucher took inspiration from artists such as Peter Paul Rubens and Antoine Watteau. Boucher's early works celebrate the idyllic and tranquil portrayal of nature and landscape with great elan. However, his art typically forgoes traditional rural innocence to portray scenes with a definitive style of eroticism as his mythological scenes are passionate and intimately amorous rather than traditionally epic. 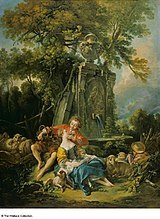 Boucher's paintings of a flirtatious shepherd and shepherdess in a woodland setting, featured in The Enjoyable Lesson (The Flute Players) of 1748 and An Autumn Pastoral (The Grape Eaters) of 1749, were based upon characters in a 1745 play by Boucher's close friend Charles-Simon Favart. Boucher's characters in those paintings later inspired a pair of figurines created by the Sèvres Porcelain Manufactory, c. 1757-66. Marquise de Pompadour (mistress of King Louis XV), whose name became synonymous with Rococo art, was a great admirer of his work. Marquise de Pompadour is often referred to as the "godmother of Rococo"  and Boucher’s portraits were central to her self-presentation and cultivation of her image. For instance, Boucher's 'Sketch for a Portrait of Madame de Pompadour', displayed in the Starhemburg room at Waddesdon Manor, acts as a surviving example of the oil preparation prior to the, now lost, portrait. 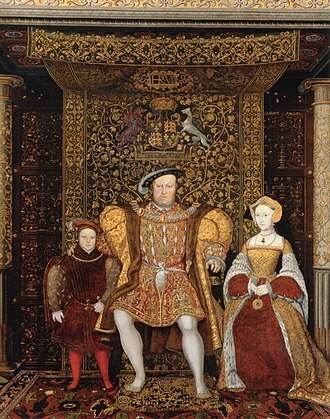 In one hand she holds her hat, in the other she picks up a pearl bracelet with a portrait of the king – symbolising the relationship upon which her status depends. Boucher's paintings such as The Breakfast (1739), a familial scene, show how he was as a master of the genre scene, where he regularly used his own wife and children as models. These intimate family scenes are contrasting to the licentious style seen in his Odalisque portraits. The dark-haired version of the Odalisque portraits prompted claims by the art critic Denis Diderot that Boucher was "prostituting his own wife", and the Blonde Odalisque was a portrait that illustrated the extramarital relationships of the King. Boucher gained lasting notoriety through such private commissions for wealthy collectors and, after Diderot expressed his disapproval, his reputation came under increasing critical attack during the last years of his career. Along with his painting, Boucher also designed theater costumes and sets, and the ardent intrigues of the comic operas of Charles Simon Favart closely paralleled his own style of painting. Tapestry design was also a concern. For the Beauvais tapestry workshops he first designed a series of Fêtes italiennes ("Italian festivals") in 1736, which proved to be very successful and often rewoven over the years, and then, commissioned in 1737, a suite of the story of Cupid and Psyche. During two decades' involvement with the Beauvais tapestry workshops Boucher produced designs for six series of hangings in all, like the tapestry showing Psyche and the Basketmaker from 1741–1742. 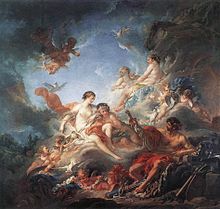 Boucher was also called upon for designs for court festivities organized by that section of the King's household called the Menus-Plaisirs du Roi and for the opera and for royal châteaux Versailles, Fontainebleau and Choisy. His designs for all of the aforementioned augmented his earlier reputation, resulting in many engravings from his work and even reproduction of his designs on porcelain and biscuit-ware at the Vincennes and Sèvres factories. 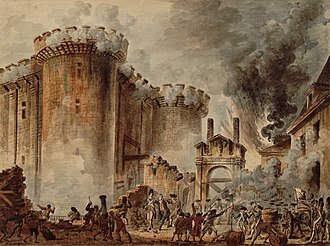 The death of Oudry in 1755 put an end to its contribution to Beauvais but his collaboration with the Gobelins lasted until 1765, when he stepped down from his position as an inspector. 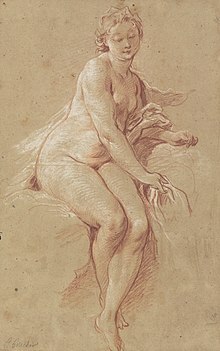 Boucher was a very prolific and varied draftsman. His drawings served not only as preparatory studies for his paintings and as designs for printmakers but also as finished works of art for which there was a great demand by collectors. Boucher followed standard studio practices of the time, by first working out the overall composition of his major canvases, and then making chalk studies for individual figures, or groups of figures. He also relied on oil and gouache sketches in the preparation of major commissions. Gradually he made more and more sketches as independent works for the market. The Adoration of the Shepherds (Metropolitan Museum of Art), a free and painterly sketch in gouache, was long considered a preparatory sketch for Madame de Pompadour’s private altarpiece La lumière du monde (ca. 1750, Musée des Beaux-Arts, Lyon). Recent scholarship suggests, however, that it was made at least 10 years later as an autonomous work. In the last decade of his career the artist began to favor brown chalk, a fabricated medium. Boucher was also a gifted engraver and etcher. Boucher etched some 180 original copperplates. He made many etchings after Watteau. He thus helped propagate a taste for reproductions of drawings. When his own drawings began to sell, 266 of them were etched in stipple substitutes by Gilles Demarteau. 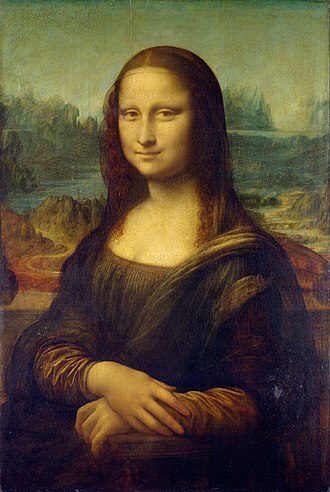 These were printed in red ink so they resembled red chalk drawings which could be framed as little pictures. They could then be hung in the small blank spaces of the elaborately decorated paneling of luxury dwellings. Boucher's most original inventions were decorative, and he contributed to the fashionable style of chinoiserie, after having etched 12 'Figures Chinoises' (Chinese figures) by Watteau. This is an incomplete list of works by François Boucher. ^ Leturcq, Jean François (1873). Notice sur Jacques Guay, graveur sur pierres fines du roi Louis xv. Documents émanant de Guay, et notes sur les œuvres de gravure en taille-douce et en pierres fines de la marquise de Pompadour. pp. 10–12. Retrieved 2014-08-24. ^ Hoskin, Dawn (September 30, 2014). 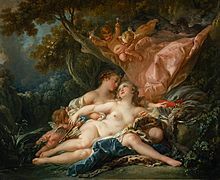 "Born on this Day: Francois Boucher". Victoria and Albert Museum. ^ Voss, Hermann; Barea, Ilse (March 1953). 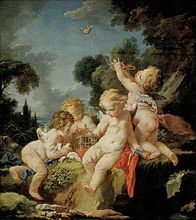 "Francois Boucher's Early Development". The Burlington Magazine. Burlington Magazine Publications Ltd. 95: 82. JSTOR 871018. ^ Zarucchi, Jeanne Morgan (2016). "The Shepherdess' Progress: From Favart to Boucher to Sèvres". Konsthistorisk tidskrift (Journal of Art History, Stockholm). 85:2: 141–158. ^ a b Hyde, Melissa (September 2000). 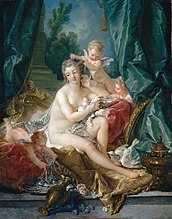 "The "Makeup" of the Marquise: Boucher's Portrait of Pompadour at her Toilette". Art Bulletin. 82 (3): 455. doi:10.2307/3051397. ISSN 0004-3079. 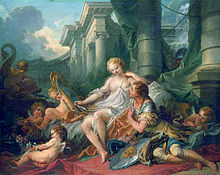 ^ Kathryn B. Hiesinger, "The Sources of François Boucher's 'Psyche' Tapestries" Philadelphia Museum of Art Bulletin 72 No. 314 (November 1976), pp. 7–23. ^ Perrin Stein. François Boucher (1703–1770) at the Metropolitan Museum of Art, October 2003. ^ "Death of Meleager | LACMA Collections". Collections.lacma.org. Retrieved 2014-04-05. ^ "Project for a Cartouche: An Allegory of Minerva, Fame, History and Faith Overcoming Ignorance and Time | LACMA Collections". Collections.lacma.org. Retrieved 2014-04-05. ^ "The Metropolitan Museum of Art – Imaginary Landscape with the Palatine Hill from Campo Vaccino". Metmuseum.org. Retrieved 2014-04-05. ^ "Monument to Mignard | LACMA Collections". Collections.lacma.org. Retrieved 2014-04-05. ^ "Venus and Mercury Instructing Cupid | LACMA Collections". Collections.lacma.org. Retrieved 2014-04-05. ^ "Cupid Wounding Psyche | LACMA Collections". Collections.lacma.org. Retrieved 2014-04-05. ^ "Les Confidences Pastorales | LACMA Collections". Collections.lacma.org. Retrieved 2014-04-05. ^ "Jeanne-Antoinette Poisson, Marquise de Pompadour". Harvard Art Museums. Retrieved 2014-04-05. ^ "Search Results". collection.waddesdon.org.uk. Retrieved 2017-04-24. ^ "The Bird Has Flown". University of Notre Dame. Retrieved 2016-03-29. ^ "The Metropolitan Museum of Art – The Interrupted Sleep". 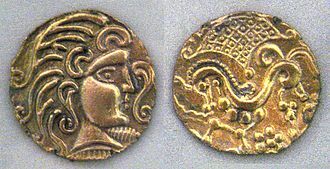 Metmuseum.org. Retrieved 2014-04-05. ^ "The Metropolitan Museum of Art – The Toilette of Venus". Metmuseum.org. Retrieved 2014-04-05. ^ "Shepherd Boy Playing Bagpipes -François Boucher, French, 1703–1770 | Museum of Fine Arts, Boston". Mfa.org. Retrieved 2014-04-05. 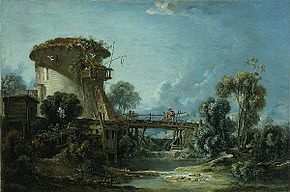 ^ "François Boucher | Landscape with a Watermill | NG6374 | The National Gallery, London". Nationalgallery.org.uk. Retrieved 2014-04-05. ^ "Venus in the Workshop of Vulcan". Artgallery.yale.edu. Archived from the original on 2014-04-07. Retrieved 2014-04-05. 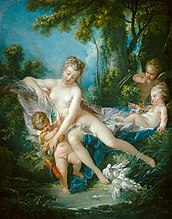 ^ "François Boucher | Pan and Syrinx | NG1090 | The National Gallery, London". Nationalgallery.org.uk. Retrieved 2014-04-05. ^ "The Metropolitan Museum of Art – Angelica and Medoro". Metmuseum.org. Retrieved 2014-04-05. ^ "The Metropolitan Museum of Art – Jupiter, in the Guise of Diana, and Callisto". Metmuseum.org. Retrieved 2014-04-05. 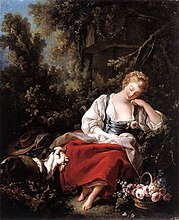 ^ "Halt at the Spring -François Boucher, French, 1703–1770 | Museum of Fine Arts, Boston". Mfa.org. Retrieved 2014-04-05. ^ "Return from Market -François Boucher, French, 1703–1770 | Museum of Fine Arts, Boston". Mfa.org. Retrieved 2014-04-05. ^ "The Metropolitan Museum of Art – Shepherd's Idyll". Metmuseum.org. Retrieved 2014-04-05. ^ "The Metropolitan Museum of Art – Washerwomen". Metmuseum.org. Retrieved 2014-04-05. Waddesdon Manor is a country house in the village of Waddesdon, in Buckinghamshire, England. It is located in the Aylesbury Vale,6.6 miles west of Aylesbury, the house was built in the Neo-Renaissance style of a French château between 1874 and 1889 for Baron Ferdinand de Rothschild as a weekend residence for grand entertaining. The last member of the Rothschild family to own Waddesdon was James de Rothschild and he bequeathed the house and its contents to the National Trust. It is now administered by a Rothschild charitable trust that is overseen by Jacob Rothschild and it is one of the National Trusts most visited properties, with around 335,000 visitors annually. 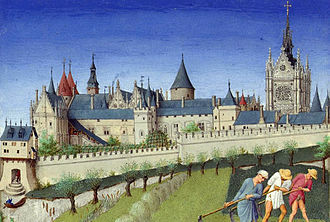 Prior to the construction of Waddesdon Manor, no house existed on the site, Ferdinand de Rothschild wanted a house in the style of the great Renaissance châteaux of the Loire Valley. The Baron, a member of the Viennese branch of the Rothschild banking dynasty, Destailleur was already experienced in working in this style, having overseen the restoration of many châteaux in that region, in particular that of the Château de Mouchy. Through Destailleurs vision, Waddesdon embodied an eclectic style based on the châteaux so admired by his patron, Baron Ferdinand. The towers at Waddesdon were based on those of the Château de Maintenon, following the theme of unparalleled luxury at Waddesdon, the windows of the towers at Waddesdon were glazed, unlike those of the staircase at Chambord. They are far more ornate, the structural design of Waddesdon, was not all retrospective. The house had hot and cold running water in its bathrooms, central heating, the building contractor was Edward Conder & Son. Works were acquired for their quality and fine provenance. One of the highlights of the collection is the extraordinary musical automaton elephant, dating from 1774, in the 1890s, Baron Ferdinand focused on the Renaissance collection for his small museum in the New Smoking Room. This collection was bequeathed to the British Museum and is now known as the Waddesdon Bequest, the interior of Waddesdon Manor was photographed in 1897 for Baron Ferdinands privately published The Red Book. Chinoiserie is the European interpretation and imitation of Chinese and East Asian artistic traditions, especially in the decorative arts, garden design, literature and music. First appearing in the 17th century, this trend was popularized in the 18th century due to the rise in trade with China, as a style, chinoiserie is related to the Rococo style. 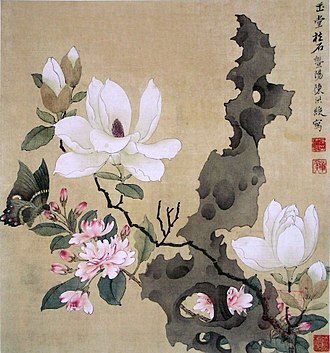 Chinoiserie entered European art and decoration in the mid-to-late 17th century and it was popularized by the influx of Chinese and Indian goods brought annually to Europe aboard English, Dutch and Swedish East India Companies. There was a revival of popularity for chinoiserie in Europe and the United States from mid-19th Century through the 1920s, though usually understood as a European style, chinoiserie was a global phenomenon. Local versions of chinoiserie were developed in India, Japan and those products inspired local artists and artisans such as ceramicists making Talavera pottery at Puebla de Los Angeles. There were many reasons why chinoiserie gained such popularity in Europe in the 18th century, Europeans had a fascination with the exotic East due to their increased, but still restricted, access to new cultures through expanded trade with East Asia, especially China. While Europeans frequently held inaccurate ideas about East Asian, this did not necessarily preclude their fascination, in particular, the Chinese who had exquisitely finished art. 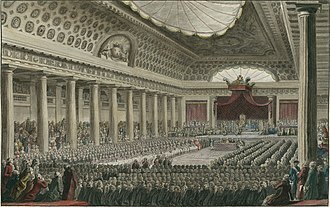 Whose court ceremonial was even more elaborate than that of Versailles were viewed as highly civilized. According to Voltaire in his Art de la Chine, The fact remains that four years ago. In other words, somewhere, on the side of the world, there existed a culture so rich that it rivaled the civilizations of Rome. 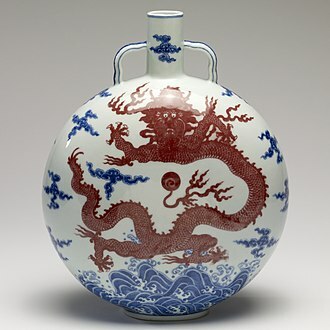 Chinoiserie created a juxtaposition between something new and exotic for Europeans while at the same time reflecting the values of the 4,000 year old culture from which these objects came. Some critics saw the style as …a retreat from reason and taste and it was viewed as lacking the logic and reason upon which Antique art had been founded. Architect and author Robert Morris claimed that it …consisted of mere whims and chimera, without rules or order, it requires no fertility of genius to put into execution. The Manufacture des Gobelins is a tapestry factory located in Paris, France, at 42 avenue des Gobelins, near the Les Gobelins métro station in the 13th arrondissement. The factory is open for guided tours several afternoons per week by appointment as well as for casual visits every day except Mondays and some specific holidays. The Galerie des Gobelins is dedicated to exhibitions of tapestries from the French manufactures and furnitures from the Mobilier national. The Gobelins were a family of dyers who, in the middle of the 15th century, established themselves in the Faubourg Saint-Marcel, Paris, on the banks of the Bièvre. In 1629, their sons Charles de Comans and Raphaël de la Planche took over their fathers tapestry workshops and their partnership ended around 1650 and the workshops were split into two. 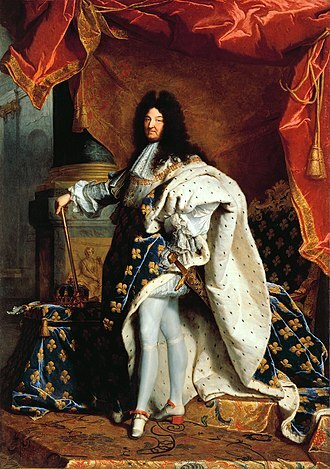 Tapestries from this early, period are sometimes called pre-gobelins, on account of Louis XIVs financial problems, the establishment was closed in 1694, but reopened in 1697 for the manufacture of tapestry, chiefly for royal use. A pastoral lifestyle is that of shepherds herding livestock around open areas of land according to seasons and the changing availability of water and pasture. 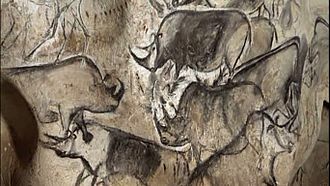 It lends its name to a genre of literature, art, a pastoral is a work of this genre, known as bucolic, from the Greek βουκολικόν, from βουκόλος, meaning a cowherd. Pastoral is a mode of literature in which the author employs various techniques to place the life into a simple one. Thus, pastoral as a mode occurs in many types of literature as well as genres, terry Gifford, a prominent literary theorist, defines pastoral in three ways in his critical book Pastoral. The first way emphasizes the historical perspective of the pastoral in which authors recognize and discuss life in the country. This is summed up by Leo Marx with the phrase No shepherd, the second type of the pastoral is literature that describes the country with an implicit or explicit contrast to the urban. The third type of pastoral depicts the life with derogative classifications. Hesiods Works and Days presents a golden age when people lived together in harmony with nature and this Golden Age shows that even before Alexandria, ancient Greeks had sentiments of an ideal pastoral life that they had already lost. This is the first example of literature that has pastoral sentiments, ovids Metamorphoses is much like the Works and Days with the description of ages but with more ages to discuss and less emphasis on the gods and their punishments. In this artificially constructed world, nature acts as the main punisher, another example of this perfect relationship between man and nature is evident in the encounter of a shepherd and a goatherd who meet in the pastures in Theocritus poem Idylls 1. 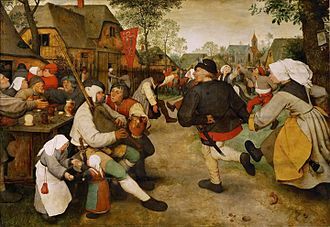 Traditionally, pastoral refers to the lives of herdsmen in a romanticized, the pastoral life is usually characterized as being closer to the Golden age than the rest of human life. The setting is a Locus Amoenus, or a place in nature. 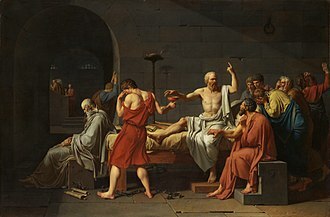 An example of the use of the genre is the poem by the 15th-century Scottish makar Robert Henryson Robene and Makyne which contains the conflicted emotions often present in the genre. Alexander Roslin was a Swedish portrait painter who worked in Scania, Paris, Warsaw and St. Petersburg, primarily for members of aristocratic families. He combined insightful psychological portrayal with a representation of fabrics. In his choice of style and lustrous, shimmering colors Alexander Roslin exemplifies Rococo and he lived in France from 1752 until 1793, a period that spanned most of his career. Rococo artists opted for a more jocular and ornate style, characterized by lightness and graceful approach to art and architecture. 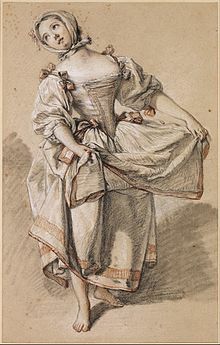 The painting by Roslin depicting Jeanne Sophie de Vignerot du Plessis, Alexander Roslin was born on 15 July 1718, in Malmö, the son of naval physician Hans Roslin and Catherine Wertmüller. 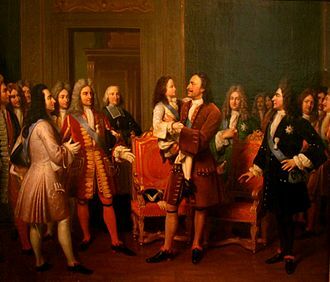 Stockholm had become an intellectual and artistic center since Queen Christina had established connections with Paris, at the age of sixteen he became apprenticed to the court painter Georg Engelhard Schröder in Stockholm, studying painting there until 1741 and beginning to paint large portraits in oils. 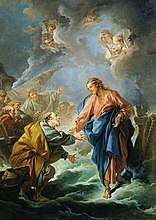 Schröder was influenced by Hyacinthe Rigaud and Nicolas de Largillière, in 1741, Roslin settled in Gothenburg, and the following year moved to Scania, where he remained until 1745 painting portraits and creating religious paintings for the church at Hasslöv. In 1745, Roslin left Sweden for Bayreuth, where he had invited to work for Frederick. 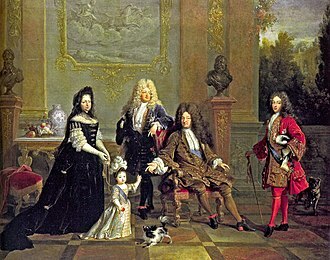 In 1747, he moved to Italy to study the works of the great masters, while in Italy he portrayed, among others, the family of Philip, Duke of Parma in 1752. 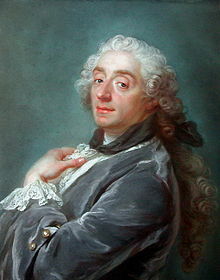 In the same year Roslin moved to Paris, at the age of 34, here, in 1759, he married the pastel painter Marie-Suzanne Giroust. The couple had three sons and three daughters, in 1768 Roslin painted her dressed in Bolognese fashion, Lady with Veil, a portrait that the art critic and philosopher Denis Diderot judged très piquante. In 1767 he painted a portrait of them both, she is depicted working in pastels on a portrait of Henrik Wilhelm Peill, while Roslin points at a gold box he received from Peill as a present. 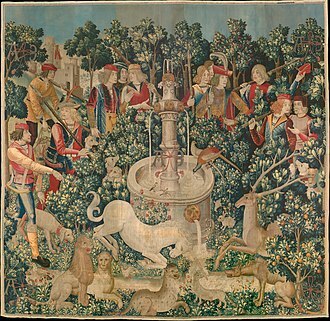 Whereas the royal Gobelins manufacture executed tapestries for the royal residences and for ambassadorial gifts, the manufacture at Beauvais always remained a private enterprise. Behagles first successes were a suite of Conquests of the King which complemented a contemporaneous Gobelins suite showing episodes in the Life of the King, a suite of Acts of the Apostles, following copies of Raphaels cartoons, are in the cathedral of Beauvais. The great series of Grotesques initiated in the 1690s became a mainstay of Beauvais production, behagle continued his private workshops in Paris, as had his predecessor. From these shops came the suite of Marine Triumphs with the arms of the comte de Toulouse, on his death in 1705, the Beauvais manufacture was continued by his wife and son, and in 1711 by new proprietors, the brothers Filleul. 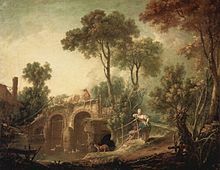 Between 1722 and 1726, Beauvais was directed by Noël-Antoine de Mérou, and maintained showrooms in Paris, the great period of Beauvais tapestry begins with the arrival of Jean-Baptiste Oudry,22 July 1726, replacing the unsatisfactory Jacques Duplessis. The Embarkation for Cythera, 1717, was Jean-Antoine Watteau's reception piece for the Académie Royale de Peinture et de Sculpture. Plan of Waddesdon's ground floor. 1:Vestibule; 2:Entrance Hall, 3 Red Drawing room; 4:Grey Drawing Room; 5:Library; 6:Baron's Sitting room; 7:Morning Room; 8:West Hall; 9:West Gallery; 10:East Gallery; 11:Dining Room; 12:Conservatory; 13:Breakfast Room; 14:Kitchen; 15:Servant's Hall; 16:Housekeeper's Rooms; 17:Site of further servants quarters (not illustrated); 18:Terrace and parterre; 19 North Drive; St:staircases. 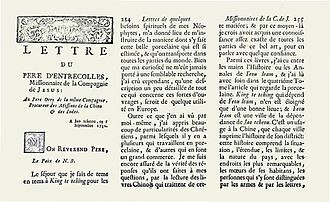 Section of a letter from Francois Xavier d'Entrecolles about Chinese porcelain manufactuting techniques, 1712, re-published by Jean-Baptiste du Halde in 1735. Vincennes soft porcelain plate, 1749-1753. 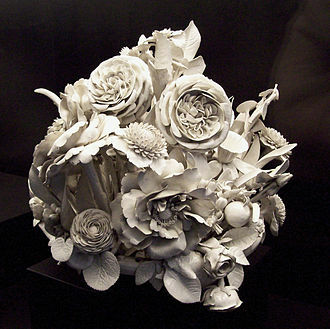 Vincennes soft porcelain seau, 1749-1753. Vincennes soft porcelain cup, 1750-1752. Madame de Pompadour at Her Toilette by Boucher (1758). She is wearing Guay's cameo of Louis XV on her wrist. Time Saving Truth from Falsehood and Envy (1737) Completed on the day before the artist’s suicide.